I love fit-n-flare dresses but they tend to make my legs look too skinny. Ones with narrow skirts look best...sort of a sheath with waist definition. Here are some I wear in summer. All are knee length on me. In finds I also included my mules that go with everything and a silver bag, although I have a better matched bag now that needs a Find. I wore the white dress this week with white D'Orsay flats and a long white vest. Items are shown in finds. Nice dresses. I especially love the polka-dots. Your comment about the width of the skirt changing the appearance of the legs made me think maybe I need to gravitate more to a wider skirt to make my short and muscular legs appear more slim . . .
Joy, I think it's a question of LENGTH. I have narrow lower legs and the longer lengths look best. It seems to add volume to my legs. Or at least I convinced myself of that ;) - See pics. Cute looks here, of course. Want to see fab you sport them. They look like very nice Dresses Joy,l bet you look lovely in them. And Angie’s light blue dress with red shoes is just stunning. Joy, I think Angie might be onto something. A wider skirt would look brilliant on you at a longer length. Instead, something about being rather straight-shaped makes some A-lines and fit and flares look ... sad? on me. And then, at my age, especially with grey hair, some fit and flares look and feel too youthful, even silly. But I've made a happy rediscovery this year. First, A-lines will work if they are a stiffer, crisper fabric. A knit (and even a light woven) sort of hangs pitifully. Whereas a crisper fabric lends structure and definition and works with my own angles. Meanwhile, a fit and flare with a wide skirt will look great if the length is sufficient. Too short = too youthful/ off-balanced/ ill-proportioned on me. Midi length = elegant. For me, it has to be below the knee and longer. Joy, I got stuck reading Angie’s post on elegance because I couldn’t really decide what the word meant to me. But reading this post it struck me that you are the definition of casual elegance! Angie, at my 5'3" height, I feel stumpy if dresses are too long, but maybe I need to experiment. My ankles and lower legs are especially thin. If a skirt hits just above the curve of my calves, it seems to add a bit of bulk. Suz, good points. I used to like A-lines when I was younger and more pear shaped. I think I was traumatized in the 50's with the full skirts and dresses made for an hourglass figure. On me, just sad. Cardiff girl, Angie, and Anchie need to start getting WIW photos again. Thank you for the encouragement. Thank you, Barbara Diane and Becky. Jules, you made my day. I would love to think I could achieve casual elegance. My dear Joy, I echo the wise and wonderful Suz 100%. It's a length and crisp cotton fabric thing. YES, to hemlines hitting you just at that calf sweet spot to give you some bulk in the area. I am not curvy either - yet fit & flares work well. They work the best, actually. And you can ABSOLUTELY wear a midi as a petite. My 4ft 9 friend rocks midis. Enough said. Suz, thanks for the kind words. I LOVE THOSE DRESSES. Wow. What a lucky last minute NAS purchase that I can wear right away - and have. Workhorses. I'm not precious about the dresses - I just wear them - with flats - and get on with my day. Why the heck can't I just wear those dresses! We only leave once. Suz, not at the loft in that pic. At a client's house after a long closet edit and review, and she snapped a pic as I was about to leave to send to her Mama. Have you seen this post about mules - maybe you need a narrow? Joy, you have such beautiful summer dresses. I love the pictures of you in the black and white patterned dress - gorgeous. The outfit with the white dress, the pumps and the long white vest sounds great, very interesting. Your outfits are always stylish, Jules is right about you being the definition of casual elegance. 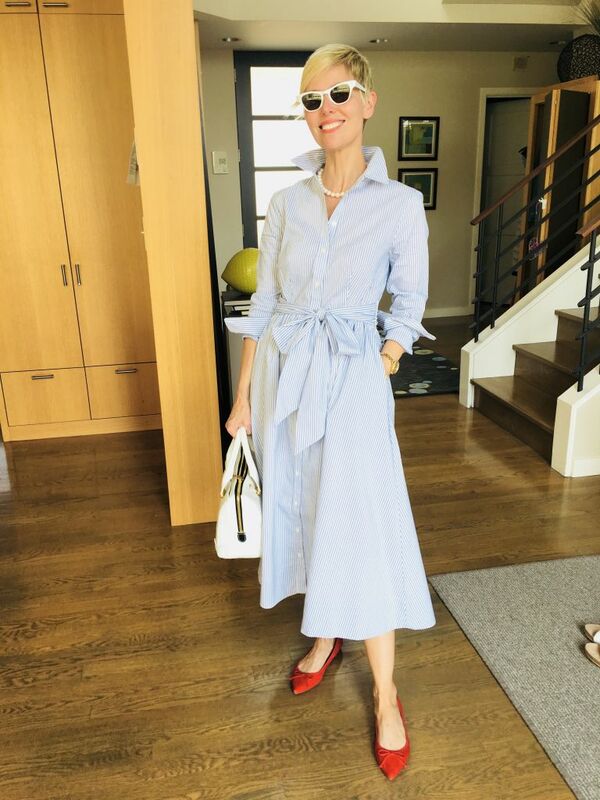 Angie, the light blue dress is super fabulous on you, just as the navy one! Joy, I LOVE the way you wear flats. You are inspirational. Joy I really like all four of these dresses, and can see why they’re workhorses. And the shoes are simple and perfect. In fact they’re somewhat like the type of dress that I like to wear. I also don’t fare well in true fit and flare. They hang and flop on my bust and legs.... then are bursting tight on my tummy.... oh dear. Fantastic dresses! I especially like the dotty one. Angie, I believe that the right fit and flare dress style is out there for me. In you blog post today the 3rd and 4th dresses with less full skirts might be good. A full skirt also makes me feel flatter on top. I do not have the contrast of a small waist. Thank you for the flats compliment. It was easier to give up heels than I thought although I have met several older women who feel heels are youthful, but flats do not need to look like sensible shoes to be comfortable. Thank you Katerina. You are a sweetheart. Jussie, you point out another problem I have with fit and flare dresses. They mostly seem made for hour glass shapes with a bust that can fill out the top and a small waist for contrast, not a rectangle. Thank you, suntiger. The dotted dress is a favorite that looks great with a pearl necklace and white shoes. Joy, you wear flats with the best of them and always look elegant! That dotty dress is so pretty on you. Don't you love how a print that includes white does wonderful things to tie an outfit together with silver and white hair? It's one of the things that makes me happiest about having gone grey! Thank you, Suz, for your kind words. I hope you find your mules. I think you will enjoy the style if you can find the right fit. As someone who is a rectangle between the chest and the hips, I can relate to Jussie and Joy on this. I do feel these dresses look better with a top half that can fill them out. Unlike them I have a pearish bottom half (9-10' between bust and widest part (thighs) so if I wear fitted bottoms you can see some shape, but that is lost in a fit and flare. My bust measurement, thanks to some recent weight gain is about the same as Angie's, but much of that is chest, not bust and my waist is quite big at the moment - only a 6 inch difference. I do have a couple of fit and flares that seem to look all right, (2 black dresses, thought the shorter one is very tight around the ribs) but this orange one makes me feel very blocky in the torso. ETA - I can't find a pic of the orange dresses, having scanned several years worth of pics) I may find it later. Thank you, Anne. I used to be wide in the ribs, but something changed. I don't know how or when. But I understand that they can affect fit. I like the second dress best of the two, but feeling tight in the ribs can be annoying and uncomfortable. Joy, flats are THE trendy shoe. And you always look elegant. Anne, I LOVE your fit & flares. Joy, wow! When did that happen? I'm not sure. I just realized one day that my ribs were no longer a major fit problem. It was probably during menopause and had something to do with losing my waist, which once was very small. Love the dresses with the flats! The black and white keep the silhouette crisp and elegant. These are lovely Joy - it is nice to have movement and breeze in the summer. Your shoes are very trendy too! Joy, I love your fit and flares. Like you, I am short and find that dresses that hit just above the curve of my calf look best and don’t make my legs look too skinny. I have scrawny ankles and don’t like to showcase them. You have an amazing collection of flats! You ARE casual elegance. Always. I can only imagine how beautiful you look in these dresses. They are timeless and so classy, just like you! the D'Orsay flats and shite vest make an incredible support act. Sal and Bijou, shoes make a huge difference in how an outfit looks, something learned from Angie and Fabbers. Breezy in summer is good. I like summer dresses heavy enough not to need a slip. Mainelady, thank you for you kind comments and understanding. You always look lovely. 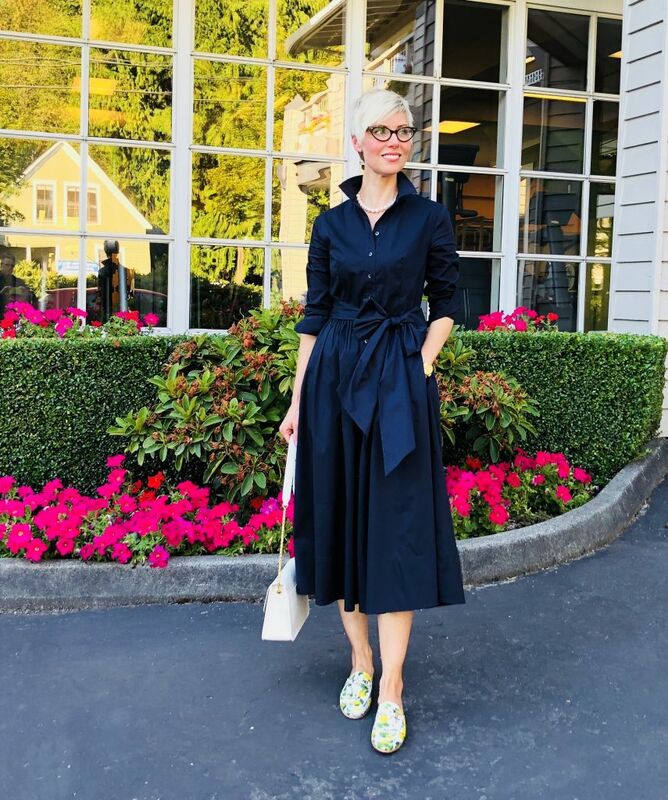 I try to chose flats carefully, following what Angie says seems to be trending as long as it is flat, comfortable and not a sandal. I need lots of shoes to change them out at least every day, sometimes more often.